Courage is one of those loaded words that everyone reacts to but no one really comprehends. Or maybe that's just me. I am ashamed at the degree to which I've stayed small and comfortable. 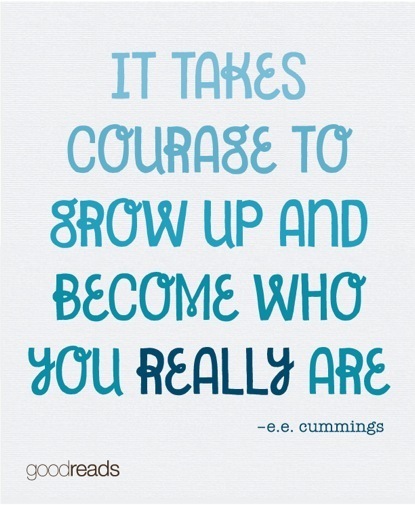 On the other hand, I don't think courage is big and bold and loud. I think courage is sitting with someone in their grief. It's being honest with those you know you're going to disappoint. Courage is not just loving; courage is letting someone love you. Courage is letting go, when it isn't hanging on. I'm anxiously awaiting my super awesome book club retreat this weekend, and struggling to read Brené Brown's Daring Greatly. When you're confronted reading a book that is about being both vulnerable and courageous, it's kind of hard to feel like you're being very brave. I was going to just blindly push through, but this prompt made that untenable. But maybe just keeping on reading (even though I invariably fall asleep) will be that small step that reverberates like a roaring lion. It's an image anyone who has been around a while has seen a number of times - the author as a young girl, windswept, safe against the mountain air in a vibrant pink sweater, eyes closed, golden skinned, a beatific smile upon her face. She's an image that calls to me. She's a touchstone of who I am or, at the least, of who I was at one point and would like to be again. The image captures both a moment in time, and a way of being. I gauge my life by how far away that girl seems to me - by how tightly wound my hair is, how tired my skin, how missing that dimpled smile. There is freedom in that girl. A sense of both adventure and security that I feel neither of in recent days. Life has somehow been tamed, shrunken, and made less comfortable. I crave the mountain top, the wind-swept, the wild. 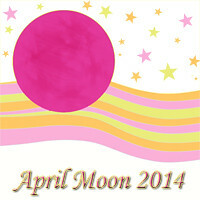 I have come very late to Kat McNally's wonderful Spring mind cleanse, April Moon. I may not have time to catch up on all the prompts, but appreciate the opportunity to reflect each day on Kat's one-word meditations.